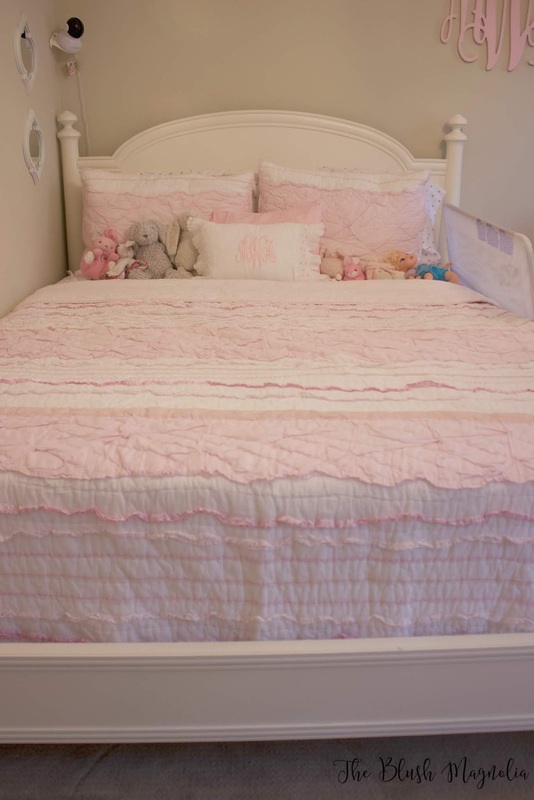 A couple months after my mother-in-law moved to Charlotte she called me and asked if I would be interested in the guest room bed from her Florida home for Madeline. When my father-in-law passed away and she decided to move closer to us the following year she was combining two homes into one and many items didn’t make the cut. The bed in question was one of them. She had purchased it just three years earlier when she and my father-in-law began spending the winters in Florida. I always feel like I am more traditional with decor than what is “on-trend” and I go towards wooden furniture. I knew this bed, unlike an upholstered headboard which I had previously considered, would last Madeline through her time in our home. Even though it wasn’t a true match for her dresser that I loved so much, I could tell that some of its details would be a great fit and the two pieces would look gorgeous together. The only problem was that it was a beautiful antique white with some distressing. While gorgeous, all of Madeline’s other furniture was true white and I knew this wouldn’t work with what I had planned for the room. I have painted furniture before but only items I’d thrifted that weren’t in great shape to start with - so that pretty much anything was an improvement. I didn’t trust my own skills with this project. I hired out the job to Re:New Charlotte, a local company that specializes in painting and upcycling furniture. They will even help you source or thrift pieces if you have a specific project in mind but don’t have a piece of furniture to work with. They use a non-toxic spray lacquer paint giving each piece of furniture a long-lasting finish that is safe for children. This was also very important to me because I am so picky about chemicals in our home and especially on her bed because Madeline chewed tons of paint off her crib! Holly was a dream to work with and made this project so easy! I am so very pleased with how the bed turned out and hope that I can use her again for a future project. We already had a queen box spring in the room that will become the nursery soon and after so much research and visiting half a dozen mattress stores in town, I decided to go with this mail order mattress from Amazon. When Holly called to arrange dropping off the completed bed, I clicked order and it arrived just two days later to my door step. I lugged the box upstairs, cut the tape, and sat the mattress on top of the box spring. I was a little skeptical at first but by the next day it had sprung to life and was the size of a queen mattress. How easy! I also ordered this waterproof mattress pad at the same time because Madeline is a toddler after all! Once the bed was in place, I started on the bedding, which I'll share more about in the next couple weeks once the last pieces are in place. 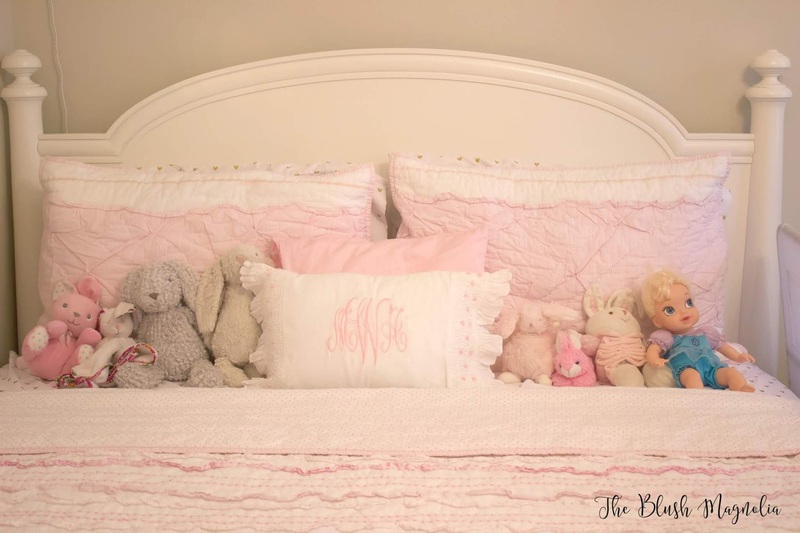 Madeline just loves her "big girl bed" and the transition has been so much easier than I anticipated - but that's a whole other post in itself. I will say, though, that this clock played a big part. 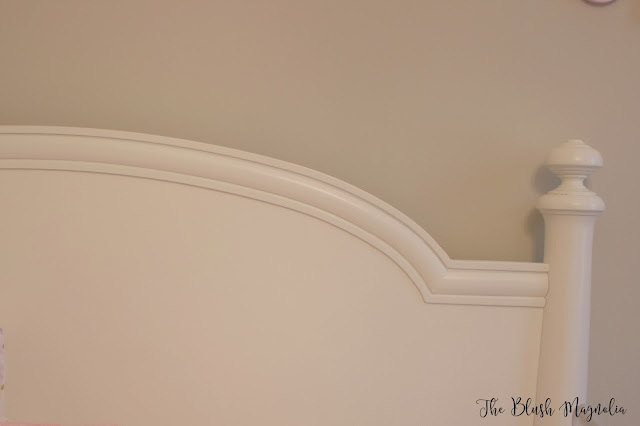 I loved being able to repurpose a beautiful piece that would've otherwise just been headed to consignment and make it a special place for Madeline. We are moving right along with Madeline's room transformation and have some big changes happening today that I'll share more about next week. 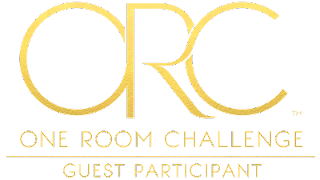 Don't forget to check out the rest of the participants' room makeovers here. The bed looks beautiful, and so love that it was a piece from your family! The room seems to be coming together so nicely! Love a good repurposed bed, that is what we did for E, but with a twin. Her room looks so, so pretty! Great job refinishing the bed! Love this bed! What dream room for a little girl! Yay, what exciting progress! I love repurposed furniture. Such a smart way to redecorate! It is a lovely bed! We get given a TON of furniture from parents and family - in fact, at least 60% - the PILs change furniture constantly and we get cast offs from the hotel - it's great! I would certainly do as you do - use the non-toxic paint - especially for children - did you buy non-toxic for the cot (I think you say crib) as well? I bet Madelaine is getting so excited seeing this coming together! 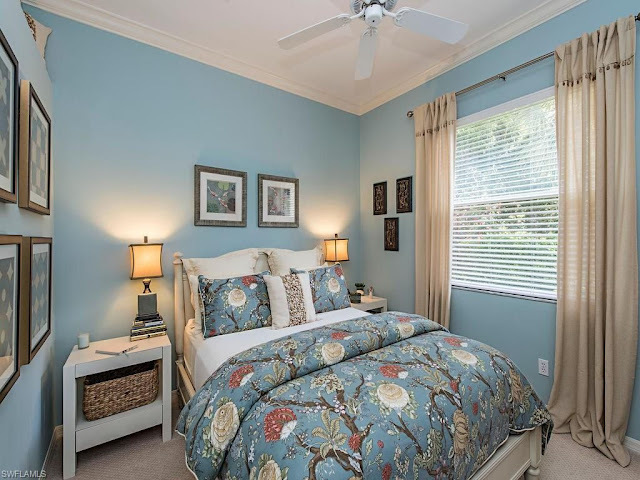 Love the image of the bed in the 'blue room' - gorgeous!